1. Whole grains (rice, wheat, oats, millet, corn) contain Vitamin B complex and fiber that will keep your skin moist and smooth and release energy for normal skin metabolism. 2. Fresh fruits (avocado, banana, pomegranate, berries, tomato, papaya) and dark green, orange vegetables contain antioxidants that are effective in neutralizing the damaging free radicals. 3. Nuts (walnuts, flaxseed, almonds) are the key elements in a healthy-skin diet to deliver sufficient essential fatty acids. 4. Citrus (orange, lemon, grapes, lime, musambi, kiwi) source of vitamin C and bioflavonoids, help to support collagen in the skin, keeping the skin firm and young looking. 5. Green Tea is the one item we all should incorporate into our daily routine. Being rich in antioxidants, it will help to reduce UV damage, thereby reducing the signs of ageing like wrinkles and freckles. 6. Red meat, poultry, salmon, egg source of iron, zinc, selenium ,vitamin A will keep the skin supple, and protect it from free radicals. However, choose lean meat over fatty meat. 7. Water keeps your cells hydrated, while moving good nutrients in and toxins out, thus giving a healthy and young look to the skin. A good amount to shoot for is around 8-10 glasses a day. 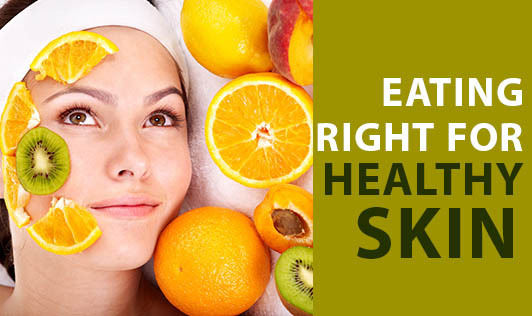 So for healthy looking skin, keep your diet balanced and stress at optimal level.